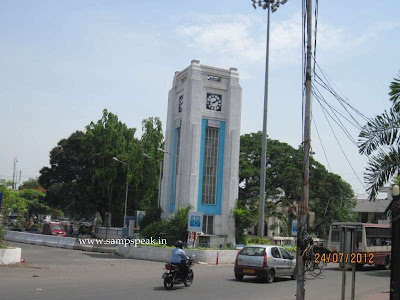 Mattuthavani is the name of a place in Madurai… the name probably originated from the sale activities of cattle… now there is an integrated bus stand purportedly the second largest bus terminus next only to Koyambedu bus terminus in Chennai. Be it Zoos or in Nature – the National bird of India, peacock is most attractive. Things happen naturally in the wild …….. Travelling by train, one gets to see more of them around Kovilpatti, Sri Villiputhur, Tuticorin, Tirunelveli areas….. then there is this place once a renowned seat of the Bharatanatyam ~ Viralimalai, which should have been a prosperous village in Chola era. Peacocks are abundant in the region and Viralimalai forms a sanctuary for the birds. Peafowl are two Asiatic and one African species of flying bird in the genus Pavo of the pheasant family, Phasianidae, best known for the male's extravagant eye-spotted tail covert feathers, which it displays as part of courtship. The male is called a peacock, the female apeahen, and the offspring peachicks. The Indian Peafowl or Blue Peafowl (Pavo cristatus) is a large and brightly coloured bird of the pheasant family native to South Asia. These stiff and elongated feathers of the male are raised into a fan and quivered in a display during courtship. These birds forage for berries, grains but will also prey on snakes, lizards, and small rodents. Their loud calls make them easy to detect, and in forest areas often indicate the presence of a predator such as a tiger. Peacocks are polygamous, and the breeding season is spread out. They lay eggs which are incubated by female – the chicks are taken care of by the mothers. Peacock eggs take between 28 and 30 days to incubate and hatch. At this stage and when their young they could fall prey to predators. Here is something translated from an interesting report read in ‘Dinamalar’….. the Mattuthavani bus stand systematically replaced the Palanganatham and old bus stands of Madurai. 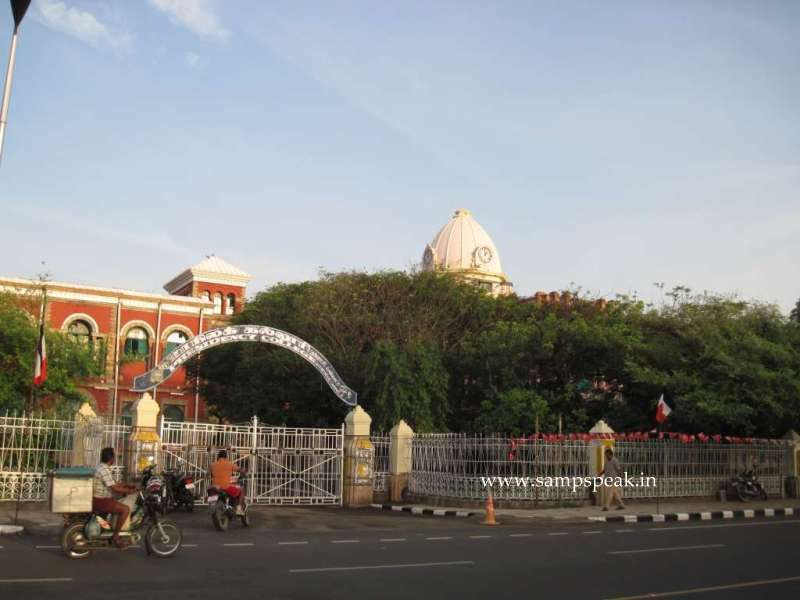 Dinamalar reports that at Mattuthavani lake area – in the house of an advocate of the High Court by name R Gandhi – something different was noticed. In the fully grown vegetations in vacant lands, lot of peafowls used to assemble and some dogs were seen circling a place, where some eggs were found. Mr R Gandhi and his team of advocates saw 7 eggs and were concerned of its safety. They prepared a sandbucket, kept those eggs found and kept an electric bulb too. In a couple of days, from two eggs peacocks came out and they hatched the other eggs too, in the same fashion. Those chicks that came out were fed glucose through ink-fillers. Now the peafowl chicks are happily playing with small kids over there. They plan to grow them a little bigger and release them into the wild with the help of Forestry Department to ensure their safety. Siam is in trouble…. The Kingdom of Thailand is located at the centre of the Indochina peninsula in Southeast Asia. It is a constitutional monarchy, headed by King Rama IX, the ninth king of the House of Chakri, who, having reigned since 1946, is the world's longest-serving current head of state and the longest-reigning monarch in Thai history. Had earlier posted about the person with the title - "Phra Bat Somdet Phra Poramintharamaha Bhumibol Adulyadej Mahitalathibet Ramathibodi Chakkrinaruebodin Sayamminthrathirat Borommanatbophit" –the title of King Bhumibol Adulyadej. The kings in the current Chakri dynasty of Thailand are often referred to as Rama. Thailand is the world's 50th largest country in terms of total area – the good looking Yingluck Shinawatra, leader of the Pheu Thai Party is the current Prime Minister following the 2011 elections. The contest was mainly between the ruling Democrats of Prime Minister Abhisit Vejjajiva and the opposition Pheu Thai. Thailand is in turmoil as there are reports of thousands of anti-government demonstrators surrounding more official buildings amid the highest tensions the country has seen since deadly unrest three years ago. Some media reports put that the number of demonstrators, led by the opposition Democrat Party, has declined from the huge gathering of roughly 100,000 people that assembled in Bangkok on Sunday. Certain sections of some roads in Bangkok have been shut down because of the number of protesters camping out and spilling into the street. Amid the tensions on the streets, Prime Minister Yingluck Shinawatra faced a no-confidence motion in parliament put forward by the opposition in an attempt to unseat the government through legal means. Critics of the Thai prime minister accuse her of being a puppet of her older brother Thaksin, a deeply polarizing figure who was removed from power by the military while in New York in 2006. He has since lived in exile, except for a brief return in 2008, and was convicted by Thai courts for corruption and sentenced in absentia to two years in prison later that year. The demonstrations have hit a crescendo as demonstrators surrounded the foreign ministry, as well as the agriculture and interior ministries. Yingluck has said authorities will "absolutely not use violence" to disperse the demonstrators. But the situation is delicate after Thai police issued an arrest warrant against protest leader Suthep Thaugsuban. The current protests have reanimated the tensions along Thailand's political fault lines -- Thaksin Shinawatra's mostly rural support base on one side, the Bangkok-based elite and middle classes on the other. The same division left the country wracked with turbulence for four years after the 2006 coup, culminating in a 2010 army crackdown on Thaksin supporters that left more than 90 dead. The current protests are in response to a government-backed amnesty bill that could have extended a pardon to Thaksin Shinawatra and opened the door for his return to Thailand. Thaksin Shinawatra, the former prime minister has dominated the country's political scene for more than a decade despite going into exile after his ouster in a 2006 coup. Thaksin, is a deeply polarizing figure -- a billionaire telecommunications mogul who built his political power on policies popular with Thailand's rural villagers. He founded Advanced Info Service, Thailand's most successful mobile phone operator. His sister, Yingluck Shinawatra, is under pressure after widespread anger over its recent failed attempt to pass a bill that could have granted amnesty to Thaksin and others. The demonstrations are bringing instability once again to Thailand, a key regional economy and popular tourist destination. Suthep Thaugsuban, a former deputy prime minister under the previous Democrat-led government, has said the demonstrations "will not stop until Thaksin's regime is wiped out. Opposition to Thaksin and Yingluck is strongest among the urban elites and middle class. That means the capital; while Thaksin's traditional support comes from the populous rural areas of north and northeast of Thailand. Today there is news that Thailand’s embattled prime minister easily survived a no-confidence vote in Parliament today[28.11.13]. Lawmakers in Bangkok voted 297 to 134 against unseating Yingluck Shinawatra. The motion never had a chance of succeeding, though, because her party and its allies hold a comfortable majority in the House of Representatives. The present protests represent the biggest threat yet to Yingluck’s administration, and they have raised fears of fresh political violence in the divided Southeast Asian nation. A statue has stirred some controversy and created ripples in the city…. Some may not instantaneously recognize VC Ganesan … but every Tamilian and most South Indians would easily recognize Sivaji… ~ a versatile actor Sivaji Ganesan [1928-2001]- popularly known as Nadigar Thilagam. In my earlier days there were so many fans of Sivaji who would keep talking hours together on his versatile acting skills. He really rose from the ranks, from a stage artist to one of National acclaim – in a career spanning close to five decades he acted in nearly 300 films in Tamil, Telugu, Kannada, Malayalam and Hindi. Ganesan was the first Indian film actor to win a "Best Actor" award in an International film festival, the Afro-Asian Film Festival held in Cairo, Egypt in 1960. Most heroes would state that they were influenced by Sivaji and most of them would have spoken the dialogue of Veera Pandia Kattabomman to get recognition of directors. He was also awarded Chevalier of the Ordre des Arts et des Lettres. His life came a long way and redefined cinema from the early Parasakthi to winning the prestigious Dadasaheb Phalke Award for his contribution to Indian cinema in 1997. His portrayal of Lord Shiva in the movie Thiruvilayadal won him lot of accolades. In the film Navarathiri (1964), Ganesan played nine different roles that represented the nine emotional states of a person. His epical portrayals in films likeThiruvilayaadal, Thiruvarutselvar, Saraswati Sabatham, Harichandran, Thirumal Perumai, Karnan and Thillana Mohanambal won him critical acclaim. He played a variety of roles such as freedom fighters like Kappalottiya Thamizhan, Vanchinathan, Tiruppur Kumaran, Bhagat Singh and epic characters like Harichandra, Karna, Bharatha, Narada,Appar, Nayanmars and Alwars. His portrayal of Raja Raja Cholan and Veerapandia Kattabomman are awe-inspiring. 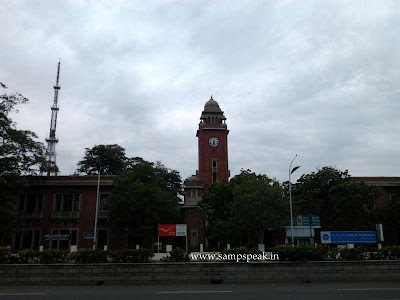 It is his statue unveiled in Kamarajar Salai in 2006 that is now under cloud. 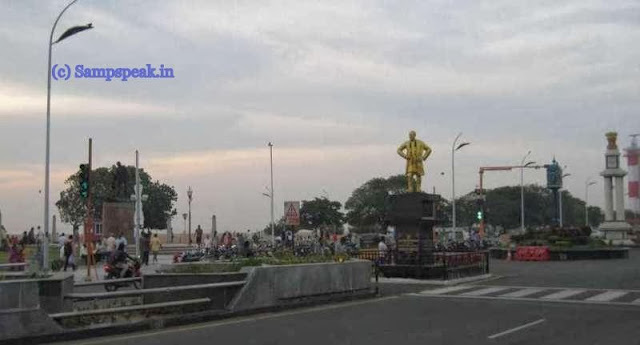 The statue of the actor is at the junction of Kamarajar Salai and Radhakrishnan Salai. The controversy is nothing anew. 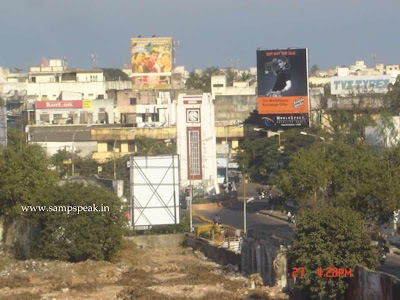 At the time of its installation, there was a petition against it stating that it would hide the view of Gandhi statue. Now the objection states that the statue obstruction of motorists waiting to turn in to Radhakrishnan Salai from Kamarajar Salai [beach road]. Last week, the First Bench, comprising acting Chief Justice R.K. Agrawal and Justice M. Sathyanarayanan, directed the jurisdictional assistant commissioner of police (Traffic) to file an affidavit in this regard. 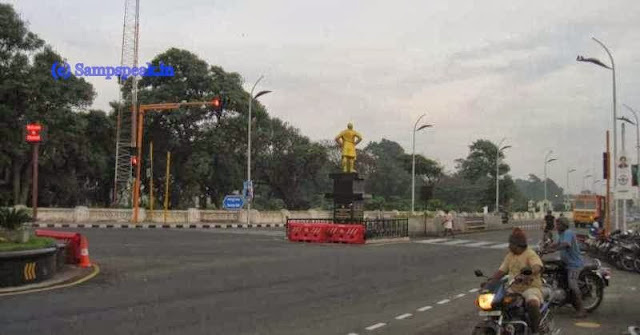 On Tuesday (26.11.13), the police submitted that because of the statue, visibility of motorists who intended to take a right turn on to Radhakrishnan Salai from Kamarajar Salai was affected. The affidavit states that because of obstruction of visibility due to the statue, several accidents had taken place at the junction. Last year, there were 12 accidents, including one that was fatal. This year, there had been eight accidents so far. 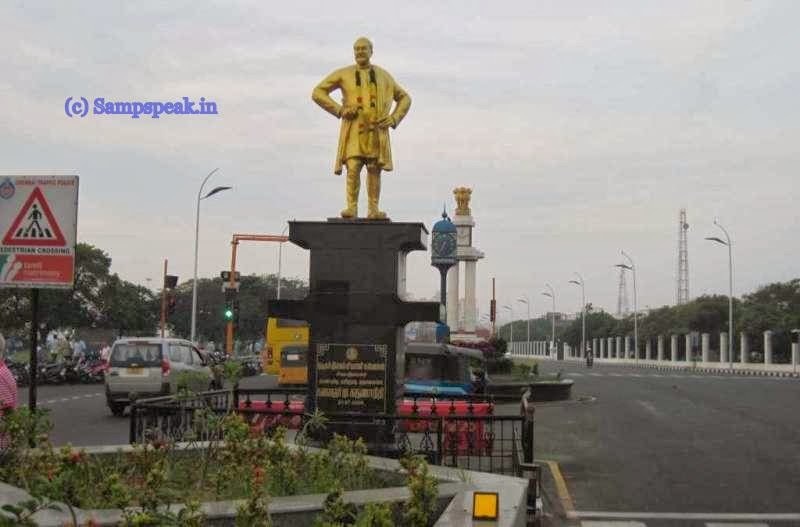 It adds that if the statue was removed, motorists on Kamarajar Salai would get more space to take a right turn at the junction. The statue may be shifted to the Marina beachfront where there were other statues, the police said. There are some including the Cine Directors who are opposing the removal of the statue. 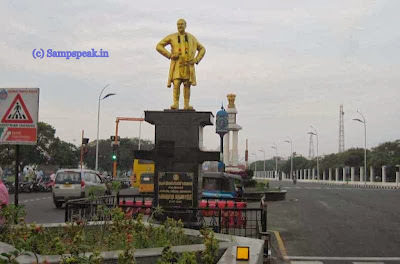 So many statues dot the Marina beach…. 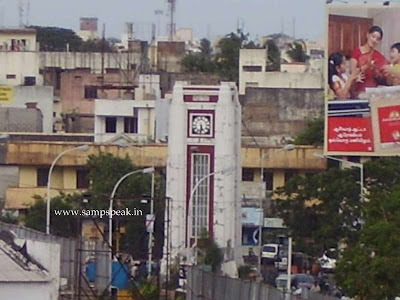 Many of them installed during the Tamil World Conference adorn the area. Poets : Kambar, Ilango, Avvaiyar, Thiruvallur, Bharathiyar, Barathidasan stand amidst Kannagi, Gandhiji, Kamarajar, Nethaji Subash Chandrabose, Annie Besant, Swami Vivekananda, Swami Sivananda, Robert Caldwell, GU Pope, Tamil thatha Saminatha Iyer as also the one of ‘triumph of Labour’. 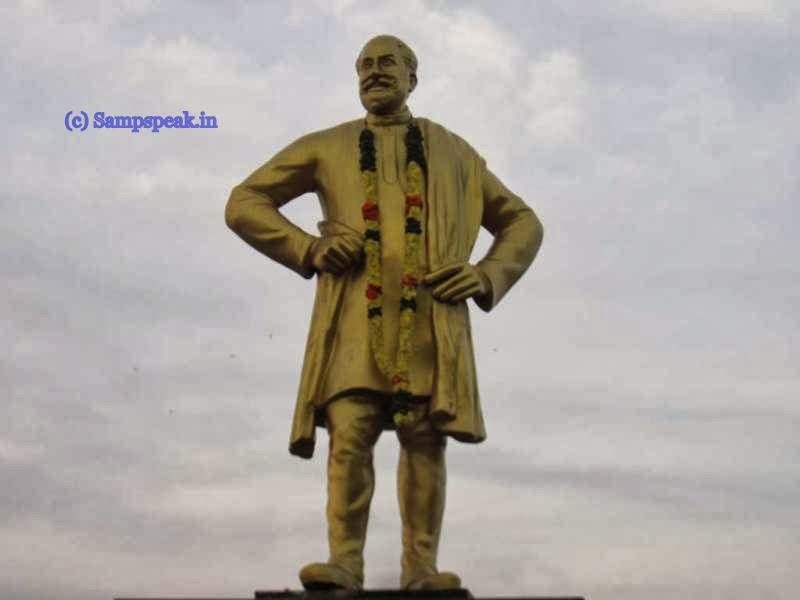 ~ only that of Sivaji Ganesan stands on the middle of the road…………….curiously enough, Sivaji sports a sherwani, a white beard and a North Indian look !!!! Unlike the case of Temples [even some of them have been re-located…] ~ these statues have no significance to the place of their pedestal but have brought in some significance to that place… that way Sivaji at the present place has little relevance [place-specific] and if it were to be relocated to a place on beach front, theoretically it should not upset the fans of Sivaji in any manner. Safety of the people is more important …. Before concluding Sivaji Ganesan had his share of International acclaim too…..President Gamal Abdel Nasser of Egypt was given a party by Sivaji. Sivaji visited US in the cultural exchange programme of the US government, in 1962, invited by the then-US President, John F. Kennedy. During his visit there, he was honoured by being made the honorary mayor of Niagara Falls, New York for one day and was presented the key to the city. The only other Indian who has had this honour before Ganesan was Jawaharlal Nehru. Back at home, his political career never took off the way his cine career did. He was made Rajya Sabha MP by the Congress party. In 1987, he floated his own political party (Thamizhaga Munnetra Munnani) which faced debacle in the elections. Every morning I commute to office through congested Zambazaar, the market place for bananas. Have seen banana plantations alongside river Tamarabarani as also around Kaveri in Trichy. Banana, that delicious fruit is the common name for herbaceous plants of the genus Musa and for the fruit they produce. Interestingly, bananas do not grow from a seed but from a bulb or rizhome. Most parts of the tree would be of use. The flower appearance is the most looked for thing. Bananas come in various shapes, sizes, colours and tastes also. They could be yellow, purple, red and green. The varieties that one get to see in local market are green, nendran, rasthali, puvan, robusta, red, hill, karpoora valli and of late G9 and more…. People love to eat bananas ~ but some throw the skins on the streets quite carelessly – which can make people tumble down and hurt themselves. Some decades ago, intentionally throwing them on street / public place and laughing when people tumble was a joke ! ….. there is thin line between such foolishness and comedy as some could hurt themselves badly stepping on a banana. 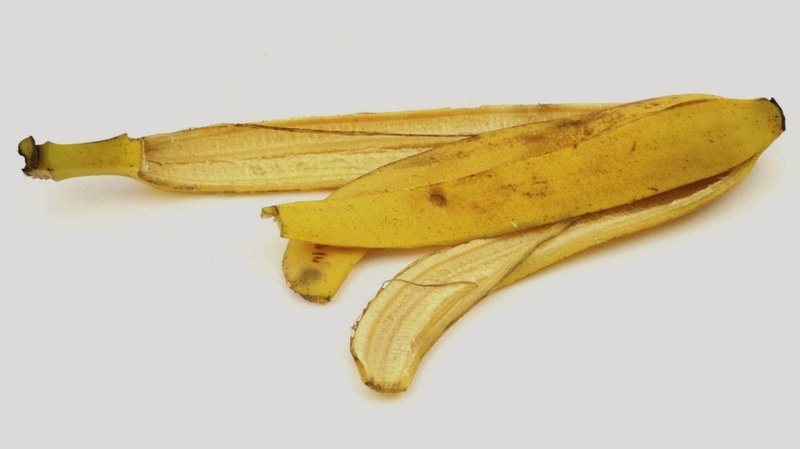 Banana skin is peel …. Heard of ‘peels of laughter’…. Actually it is ‘peals of laughter’….. A peal is : ringing of a set of bells; a loud burst of noise. A peel is the skin or rind of a fruit or vegetable. So bananas and oranges have peels, and laughter and thunder come in peals. Go bananas : would mean ‘to go crazy mildly’. Banana republic is theoretically a small, poor country with a weak or dishonest government. In Chennai, if you are to trip on a banana skin, a good Samaritan could come rushing to help you – both would end up cursing the one who carelessly threw the banana peel on the public place. There are good people who would clean and push the peel to a corner, before somebody could get hurt. Have been reading that in US, liability laws are strict and there would be lawsuits for all sorts of torts. 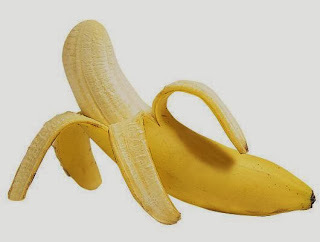 Today’s media is abuzz of reports of a man who sued the D.C. metro claiming that he slipped on a banana peel and injured himself - he has been charged with second-degree fraud. In the reported case, Maurice Owens claimed that he was riding in an elevator at the Potomac Avenue Metro station when he hurt his leg and hip after tripping on the peel. He claimed that he was riding in an elevator when, he says, he slipped on a banana peel as he was getting off, injuring his hip and leg. The man reportedly sued the transit agency for $15,000 — in part to cover $4,500 in chiropractor bills. The claim against Metro was thrown out, and Owens, 42, was charged with second-degree fraud, a felony ~ and it was due to the digital camera installed. Going by the footage it was stated that the man got into an empty elevator, and was seen flipping something onto the floor behind him. According to a Metro Transit Police report, “this object was later identified as a banana peel.” Seconds later, Owens falls to the ground — half his body inside the elevator, half outside. Owens then reported his injuries to the station manager, Metro Transit Police was called and Owens was taken to Howard University Hospital for treatment. About two weeks later, Owens filed his claim against Metro. Owens had reportedly asked why a custodian for the station had “not cleaned up the banana peel causing the fall’. Metro presented its case to the U.S. attorney’s office in the District. A warrant was issued accusing Owens of fraud, and he was arrested. This was a lone case and is one of the roughly 225 claims Metro’s Third Party Claims office receives each month. Most seek compensation for slips and falls on station platforms, stairs, escalators, elevators and buses, or while getting on and off trains. Fewer than half of those claims result in a settlement from Metro, and the average payout is less than $2,500, it is stated. Some of them include a claim for oil dripping from rail car’s air conditioner on to shirt, a person having his sandal stuck in escalator and the like. Away from this mess where the man who sued got punished thanks to CC TV footage, a Brazilian researcher, who also happens to be a banana lover, has taken an interest in the lowly banana peel and is helping to remake its image. The banana peel, it turns out, can take water dirtied by heavy metals from mining operations or other activities and turn it to clean drinking water. Stuart Broad ~ not to be named; fear in Trott's eyes and Clarke challenges Anderson for a broken arm !!! Arvinda DeSilva, Sachin Tendulkar, Brian Lara, Adam Gilchrist, Mahendra Dhoni… you can put some more on that list……. Aussies now lead the Ashes Series after their win at Gabba ~ Ashes !! – yes, the notional prize in the Test Series between England and Australia. 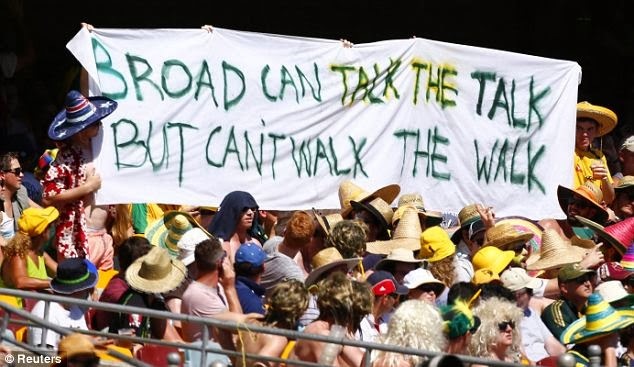 The term originated in a satirical obituary published in a British newspaper, The Sporting Times, immediately after Australia's 1882 victory at The Oval, their first Test win on English soil. 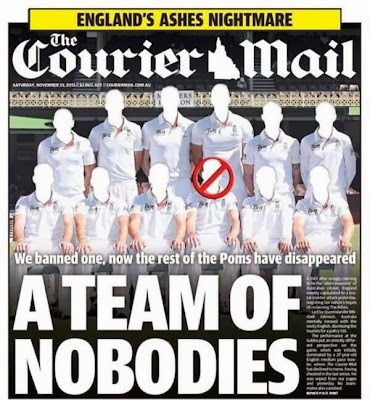 The obituary stated that English cricket had died, and the body will be cremated and the ashes taken to Australia. The mythical ashes immediately became associated with the 1882–83 series played in Australia and the series thereafter. Today, at Brisbane, after two rain interruptions, including a hail storm that scattered the crowd on day four, Johnson took five wickets as Australia dismissed England for 179 in the second innings late Sunday to claim its first victory in 10 Test matches. For those not following the game – would be too surprised to know that the hero of day 1 was not named at all……… because Aussies hate him and has been given an awful treatment ~ the man who took 6 wickets in the first innings [5 on day 1] was not named as the local paper was refusing to even print his photograph or include his name in the list of combatants on the first day of the Ashes series. That may never reveal the blood spilling … it is reported that every Aussie went for the kill; when Mitchell Johnson bowled …. It was four slips, a fly slip, two leg slips, silly mid off, short leg. Australia needed this win badly. They had not won a Test in 10 attempts and an Ashes Test in eight goes. ~ and there are reports that Michael Clarke challenged the last man Jimmy Anderson to face Johnson stating ‘get ready for a broken arm’ in a more nastier language… … this is no boxing bout and no. 11 invariably gets out for low scores – anything great in that ? Statistically, George Bailey's wicket was Graeme Swann's 250th in Tests. He is only the second England spinner, after Derek Underwood, and the seventh England bowler to take 250 or more Test wickets. Swann, who took 105 innings to reach the landmark, is second only to Ian Botham who picked up his 250th wicket in his 94th innings. He took none in the first and in the second took 2 but they came at the cost of 215 runs, ranking third on his list for most runs conceded in an innings in Tests. Swann has returns of 4 for 376 runs in two matches at the Gabba at an average of 94.0 and at a strike rate of 156. 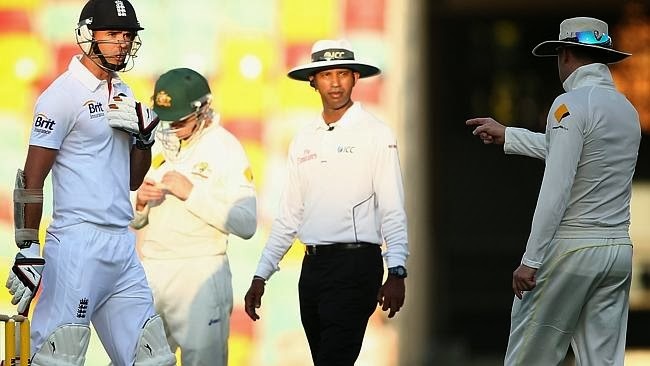 The Australian Press hails the victory stating that it was brutal attack ~ after Clarke’s outrage, Umpires were forced to calm proceedings as the sun set on a brilliant Test for Australia. They call it a brutal victory and mental disintegration of England's key batsmen ~ for a win that comes after 4-0 loss to India and a 3-0 loss to England this year. 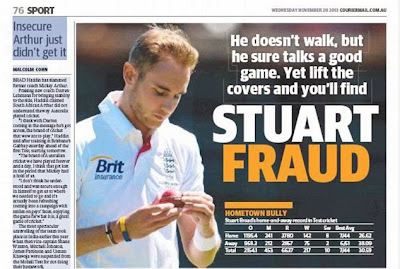 It is ‘Courier Mail’ the newspaper which refused to print the name of Stuart Broad who took 6 wickets in the 1st innings – citing the instance of his refusal to walk in the 1st test at Trent Bridge in Aug this year. The crowd at Brisbane also booed Broad and there were banners criticizing him…. All from Aussies who never believed in walking ~ save Adam Gilchrist. Ricky Ponting, the Australia captain, in a similar situation against Pakistan when a caught-behind appeal against him was turned down – stayed put fully knowing that he had nicked it……… he had done that many a times, so also many other teammates of his. They will term it as playing the game the hard way. In the New Zealand-Sri Lanka game in Mumbai involved a controversial decision when what appeared to be clean, and a brilliantly taken, one-handed catch by Nathan McCullum off Mahela Jayawardene was ruled not out by the third umpire Amish Saheba as replays were possibly inconclusive. Jayawardene, once the catch was claimed, stayed his ground and ultimately got the decision in his favour. After that Trent bridge test, Stuart Broad admitted that England may well have lost the first Ashes Test in Nottingham had he walked after edging a ball to first slip - but he stands by his decision to stand his ground. In that most controversial moment of the series, which England won 3-0, Broad was caught by Michael Clarke at first slip off left-arm spinner Ashton Agar’s bowling but was given not out by umpire Aleem Dar. Clarke and several of his team-mates pleaded with Dar but were powerless to overturn the decision because they had already burned their two reviews. In that close match England defeated Australia by 14 runs. 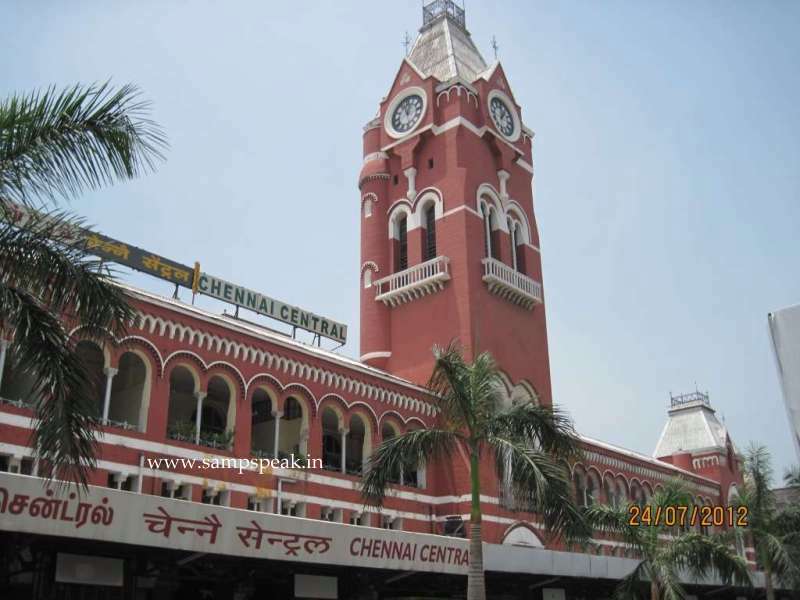 When it was underway, their site claimed ‘chennai’s newest landmark !’ – can you guess what it was…. For long it provided great quality wind to the Chennai – the Express Estates which was virtual greenery with so many trees – it housed the office of Indian Express, Dinamani and group of publications…. In that place sprung a new mall ~ a destination for Chennai youth.. you can see people waiting outside, before the mall is even open. At a time when time was at a premium and not many possessed watches – there were those ubiquitous clock towers; yes clocktowers as landmarks – some of the famous clocks include the one at Central, at Presidency college, P. Orr & sons and many other bus stands……… Britishers built lot of things which were landmarks……….. there is yet another time-tested one connecting the oldest landmark with somewhat latest……… ‘the Royapettah Clock Tower and the Express Avenue Mall’. Big Ben ~ is the nickname for the great bell of the clock at the north end of the Palace of Westminster in London. The Houses of Parliament and the clock tower, commonly called Big Ben, are among London's most iconic landmarks. Technically, Big Ben is the massive bell inside the clock tower, which weighs more than 13 tons (13,760 kg). London is famous for its Big Ben; the clock's movement is famous for its reliability. The designers were the lawyer and amateur horologist Edmund Beckett Denison, and George Airy, the Astronomer Royal. Construction is reported to have started as early in 1853 but was not complete until 1859. The clock tower looks spectacular at night when the four clock faces are illuminated. Each dial is 7 metres in diameter; the minute hands are 4.2 metres long and weigh about 100kg (including counterweights); the numbers are approximately 60cm long; there are 312 pieces of glass in each clock dial. The chimes of Big Ben were first broadcast by the BBC on 31 December 1923, a tradition that continues to this day. 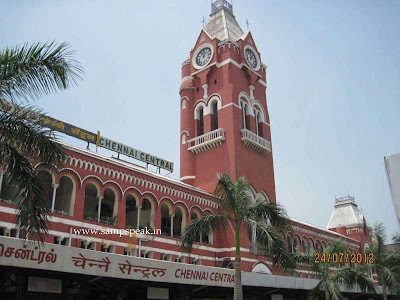 Royapettah is a centrally located in the city of Chennai. It has the famous Govt hospital. 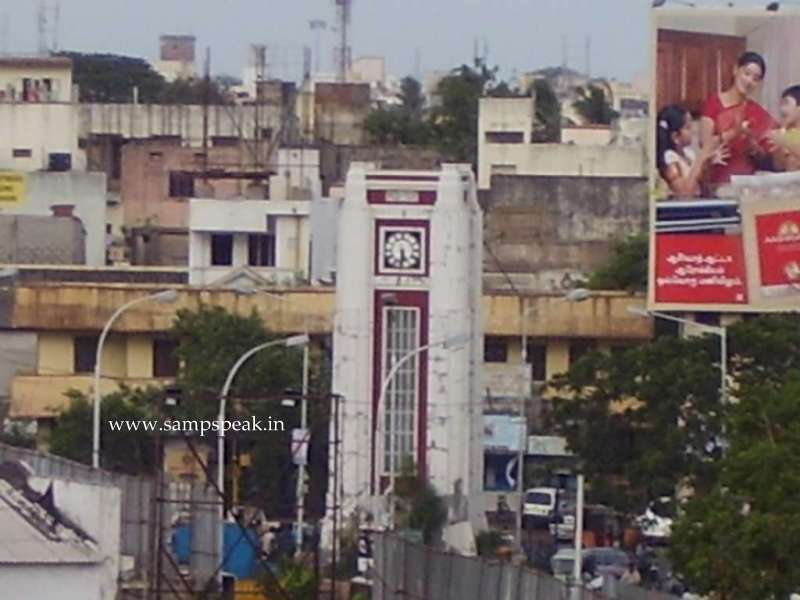 As you travel straight in Bharathiyar Salai [once Pycrofts Road] from Beach in the Presidency College / Marina Cricket ground intersection – at Woods road intersection, you still see the Royapetah clock tower, from where the road branches off as Whites Road ~ and nearer stands the once Express Estates; now the EA mall. By some account, the ruler’s [Raya’s] district [pettah or pettai] became Royapettah – not very convincing though ! ~ closer is the place of Nawab of Arcot called Amir Mahal. In the next intersection, you have the Royappetah Govt hospital. Closer to the clock tower stands Wesley Church. 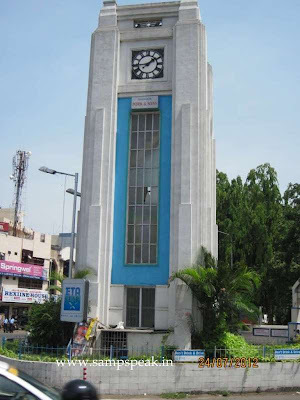 This clock tower here must be a century old at least. On the Whites Road, you have Hobarts Girls High School and you have the Principal Offices of 2 Insurance Companies – Royal Sundaram Alliance Insurance Co and on the other end near Mount Road, that of United India Insurance Co Ltd.
What is the value of ‘Allium cepa’….. Though not a rule – in general, small articles of high value are more prone to thefts; common goods which are sought in market place are prone to thefts; those goods which have a grey market attract burglars. Heavy material, Bulk goods, low priced goods, goods with short expiry date, technology driven items which are used only specialists, special medicines and the like are not ‘theft-prone’…… Insurers with long experience would vouch that losses do not follow any pattern and there are many surprises at times. Goods in transit from one place to another are exposed to many risks – theft and non-delivery are one amongst them. The purpose of taking a Marine Insurance Policy is to cover the goods whilst they are moved from one to place to another. The coverage is governed by the clauses attached to the Policy and in India – it would be ‘Inland Transit (Rail/Road) clause’ when the transit is by road / rail and Institute Cargo Clauses [C/B/A] when moved by sea. Besides the basic perils, there is ‘Theft, Pilferage and Non-delivery’ clause attached specifically to policies extending coverage. In legal parlance, Non-delivery, is failure to convey or transfer a legal instrument or goods as required by law or custom. The coverage offered under Marine Policy in respect of ‘non-delivery’ is primarily one providing indemnity when the consignment in its entirety is not delivered at destination by the Carrier to whom the goods were entrusted. BY the TPND clause, coverage is extended for shortage / short delivery too. Of course losses should be established to have occurred and should be arising out of an insured peril. Some simplest of examples of ‘non delivery’ still not within the purview of coverage could be – seizure by Public authority, package jettisoned by the carrier [when the coverage is on restricted terms], misdelivery especially on production of documents, consignment taken to wrong destination by a carrier ……..and the like. The cargo owner knows the value of their goods – it is not only the inherent value, the commercial value, or the Invoice value of the goods – also there is the potential profits that would be realized upon sale of goods at destination, the loss of market, market share, potential good will and other issues – hence generally, cargo owner would not like a loss to happen, even when they are fully protected by insurance. Still, you often come across instances of ‘high value cargo’ entrusted to literally unknown operators / carriers and often even basic check of vehicle / driver records are not carried out. There have been instances where the carrier or the lorry driver ran away with the high value cargo, thus causing a huge loss to the cargo owner. The Nashik police are on the trail of a truck driver who has vanished with 194 quintals of onions worth around Rs 10 lakh. 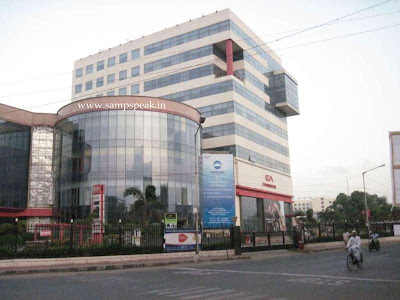 The onions, according to the police, were stolen from Swami Samarth Enterprises. 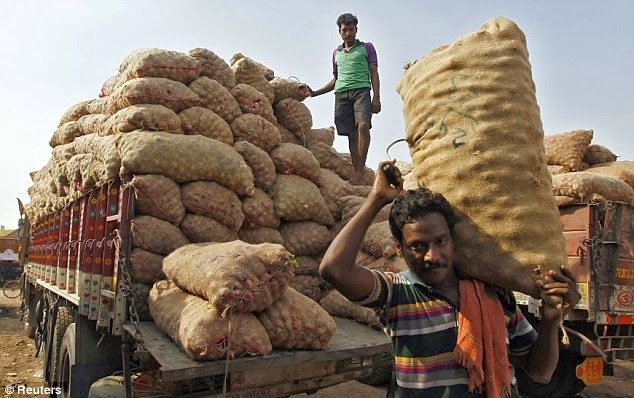 The firm's owner Anita Mahajan had purchased 194 quintals of onions from the market in Nashik. 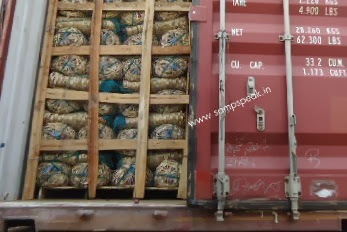 The onions were packed in 424 sacks and were to be sent to Uttar Pradesh. Mahajan had booked a truck belonging to one Faisal Khan to transport the vegetables to Uttar Pradesh on November 11. Normally, it would take around 30 hours for a truck to reach Uttar Pradesh from Nashik. However, the onions didn't reach the intended destination even after four days. not this truck though !! Failing to locate the driver and the truck, Mahajan on Monday filed a complaint with the police. Police said the truck driver, identified as Sanjay, has been missing. Police suspect he has already sold the onions. "He must not have entered Uttar Pradesh and could have sold them in Madhya Pradesh. We have formed three police teams to trace the driver," said a police officer. CB Holkar, a member of NAFED, said such incidents are known to occur whenever prices go through the roof. "We see one or two such instances during the years when prices of onion go up. Even several quintals of sugar had gone missing when the sugar prices went up in the past." He added that in most such cases, the traders come to know about the robbery very late. They are also aware that on certain occasions, the truck could have broken down. "When you don't hear from the driver of the truck and if the delivery to the intended destination is delayed by more than two days, you need to go to the police immediately," said Holkar. According to him, traders should check the registration and other documents of the transport company and should rely only on those who have been in the field for a long time. In October, a shop in Thane district was robbed of onions worth Rs.18,000. Onions, Marine transit and …. a possible Marine claim…. Interesting !! Ever heard of Sita Sahu….. ? who worked in a road-side eatery…..
Sachin chose his moment and selected his venue too….. the emotional and big moment was when Sachin Tendulkar returned to the ground after the lap of honour and bowed down to touch the 22-yard strip and prayed in a show of reverence. As Ganguly said, it was a message that whatever profession you pursue, you must respect that. You should not take it for granted if you want to make it big. Away from the Cricketing field where he sure was a Don(ald Bradman) – Sachin was bigger in Commercial market too…….. of the many brands he endorsed - Adidas, Coca Cola, Future Group, Toshiba, Aviva India, and SAR Group - said they were looking for longer association with him after retirement. He has lost some like Canon, which chose not to re-up when their deal expired last year, seeing the twilight of his career. Still he is worth many crores and reportedly his $1.2 million-per-year contract with Coca-Cola is worth more than most IPL players' entire salaries. Dhoni and now Virat Kohli are busy signing many more contracts. This year when Forbes released its list of highest earning athletes, it was 37-year-old Tiger Woods with $78.1 million being No. 1, followed by Tennis star Roger Federer at $71.5 million. Sachin Tendulkar was 51. Interestingly there were only three women in the top 100, led by Tennis ace Maria Sharapova, Serena Williams, and China’s Li. The great Indian icon Indian skipper Mahendra Singh Dhoni, was far behind Tiger Woods with earnings of $31.5 million and was at 16th place. . Last year it was boxer Floyd Mayweather Jr. nicknamed “Money” who was no. 1 ~ and he fought only twice in the previous 12 months spending less than one hour in the ring !!! So athletes earn more … and get richer more by endorsements !!!!! Most of us followed the London Olympics in 2012. More than 10,000 athletes from 204 National Olympic Committees (NOCs) participated. A total of 85 National Olympic Committees (NOCs) won medals, 54 of those countries winning at least one gold medal. The United States finished at the top of the table winning 46 gold medals and winning 104 medals overall. China finished second with 38 gold medals and 88 medals overall; and hosts Great Britain came in third place winning 29 gold medals and 65 medals overall. There was another sporting event ……the 2011 Special Olympics World Summer Games was a sporting event held in June – July 2011 at Athens, Greece. "Over 7,500" athletes, from 185 countries, competed in a total of twenty-two sports. The Special Olympics World Games are an international sporting competition for athletes with intellectual disabilities. Special Olympics World Games take place every two years. Sita Sahu, a 15 year old made India proud by winning a bronze medal each in the 200 and 1600 meter race in 2011 Athens Special Olympics. There were two Cinderella moments in Sita's life. First she accompanied seven other kids to the CM Shivraj Singh Chauhan's residence for tea with the chief minister. Less than a month later, came the crowning glory when she returned home on July 6, 2011 from Athens with two bronze medals -in 200 metres and 1,600 metres- from the special Games. 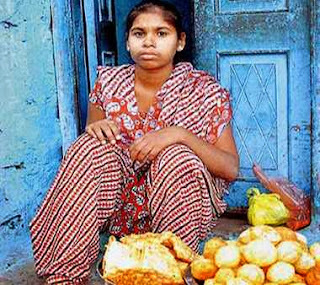 In April this year, she was in news for wrong reasons ….. she was struggling to make ends meet and was selling `gol gappas ’ in the streets. Yes, sad enough, she was working in a roadside eatery in Rewa, Madhya Pradesh. Reports suggested that this winner of 2 medals was in dire straits. Sita's mother was quoted as saying that they were very poor and her husband is also not keeping well. 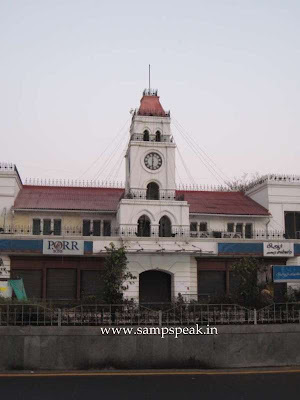 "So we have been to forced to sell the chaat and other eatables. It was the sad news official neglect stopping the 15-year-old athlete's promising career in tracks. Usha Sahu, Sita's trainer and teacher from Rewa, was sad too to see her protege's potential going waste. The silver lining was that the Social justice minister said neither the girl nor her parents ever met him but he came to know of her plight from the media reports. Then came the news of Madhya Pradesh Chief Minister Shivraj Singh Chouhan sanctioning Rs one lakh to Seeta Sahu of Rewa. The State Govt acted swiftly with Chouhan announcing financial assistance. Congress general secretary, Digvijay Singh was swift enough to criticize the Govt and spoke of assurance from the centre. Intellectual disability, also known as general learning disability, (previously known as mental retardation), is a generalized disorder characterized by significantly impaired cognitive functioning and deficits in two or more adaptive behaviors that appears before adulthood. Of the Movendars, the Chozhas have left a lasting legacy … the heartland of the Chola dynasty was the fertile Kavery valley… and at times their kingdom encompassed the entire South India and far off places too. According to tradition, the Chola country comprised the land between two streams of Vellaru and included the modern day Trichy, Thanjavur, Pudukottai and more. 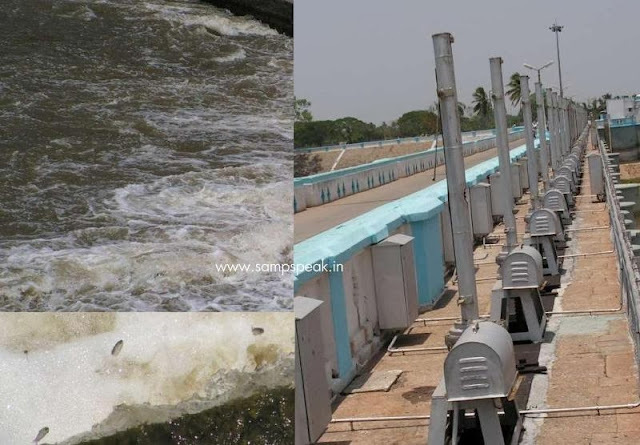 The holy river Kaveri and its Coleroon [kollidam] dominated the landscape of rich delta of paddy fields interspersed with coconut, mango and other fruit trees. The glory of river Kaveri formed an inexhaustible theme of early Tamil poetry and literature. Common names among Chola kings include Valavan and Sembiyan. Cholas adopted Tiger as their crest and it was figured on their banner too. Some of the early day Chozha kings are mentioned in Sangam literature ~ among them most famous are : Karikala Chozhan and Kochchenganan ~ as also the town of Puhar or Kaveri Poompattinam. Karikala Cholan was the son of Ilanchet Senni ~ the name Karikala would translate to ‘the man with charred leg’ – perpetuated in the memory of a fire accident in the early years of Prince’s life. We read that Karikala was deprived of his birth-right to rule and was confined in prison – the plucky manner of his escape and establishing to power is a favourite theme of many poets. The battle at Venni – a village nearer Thanjavur provided the turning point in Karikala’s career. 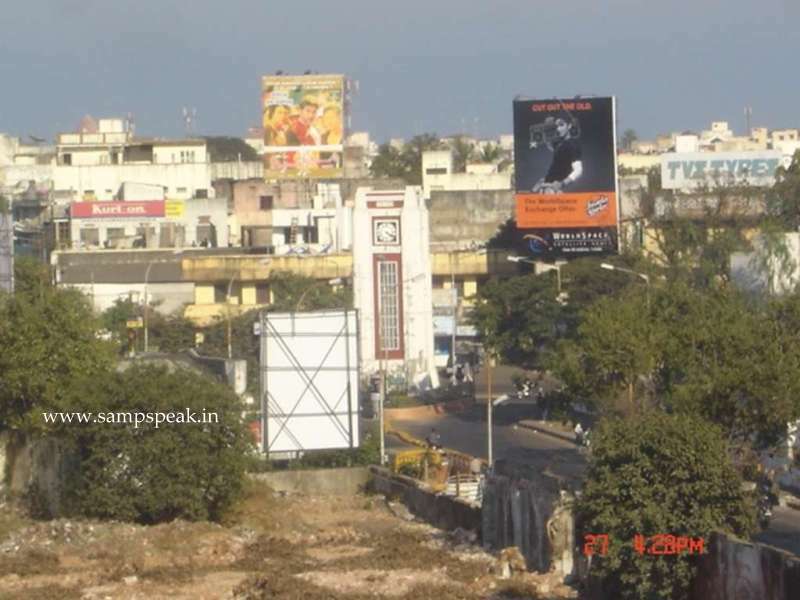 Pattinappalai describes the destruction carried by forces of Karikala. From the literature, it is observed that Karikala was known for his valour, faith in Vedic religion and the care for his subjects. The Chola kingdom mingled with the river Kaveri and the raising of the banks by Karikala are mentioned by the Melapadu plates of Punyakumara. Karikala Chola is famous for the construction of ‘the Grand Anicut’ (Kallanai). . 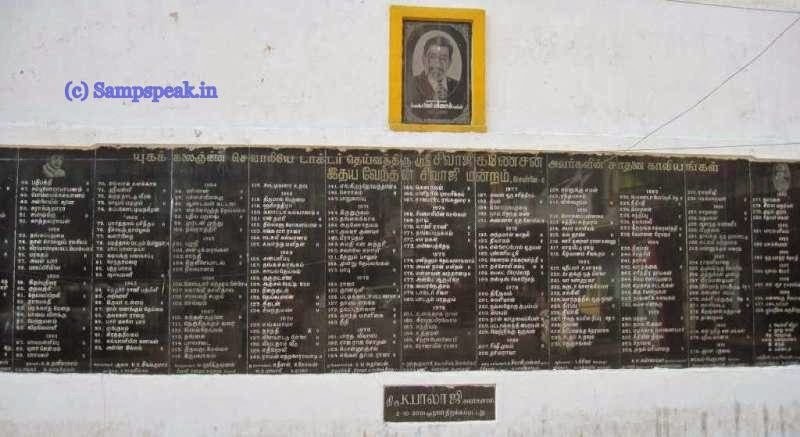 In January this year, Ms. Jayalalithaa, while inaugurating a memorial for Colonel John Pennycuick, the British engineer who built the century-old Mullaperiyar Dam, said a similar memorial would be created for the ancient Tamil king near the Grand Anicut. 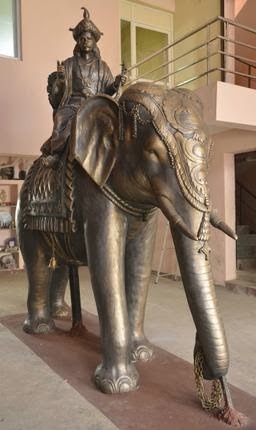 ~ now there are reports that a 14-ft statue of the king on his elephant is ready for installation. The Hindu reports that the bronze statue weighs between two and three tonnes. The image for the memorial was provided by the State government, and created by Chennai-based sculptor Kishore Nagappa “The bronze statue depicts the king astride an elephant and pointing to the kallanai. 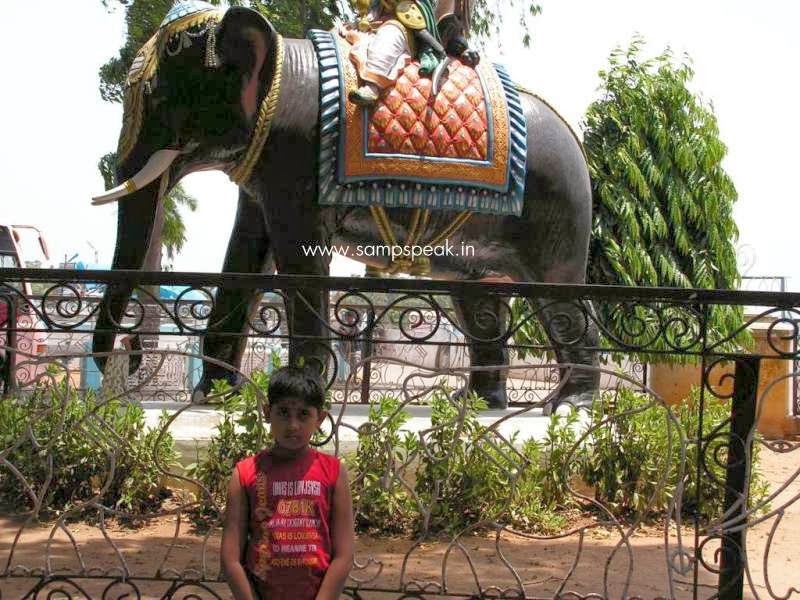 The height of the elephant is 8 ft and the king sitting on it adds another 6 ft,” said Mr. Nagappa, whose father Jayaram Nagappa created the statues of Veerama Munivar and former Chief Minister Kamaraj on the Marina, and Swami Vivekananda at Vivekananda Illam. Mr. Nagappa used ‘sandwich moulding,’ a process that is normally employed to create larger-than-life statues. “While bronze images of Gods are solid pieces, statues are made with hollow insides. Handling and putting up a solid 14-ft statue will be a Himalayan task,” he said. Kallanai (kall –stone & anai-bund) also known as the The Grand Anicut, is an ancient dam built on the Kaveri River, located about 20 km from Tiruchirapalli. It was built by the Chola king Karikala Cholaaround the 2nd Century AD and is considered one of the oldest water-diversion or water-regulator structures in the world, which is still in use. Sweeping past the historic rock of Tiruchirapalli, it breaks into two channels at the island of Srirangam, which enclose between them the delta of Thanjavur (Tanjore), the garden of Tamil Nadu. The northern channel is called the Kollidam (Kolidam); the other preserves the name of Kaveri, and empties into the Bay of Bengal at Poompuhar. The purpose of the Kallanai was to divert the waters of the Kaveri across the fertile delta region for irrigation via canals. The dam splits the river Kaveri into 4 streams known as Kollidam Aru, Kaviri, Vennaru and Puthu Aru. It is constructed from unhewn stone spanning the Kaviri and is 329 m (1,079 ft) long, 20 m (66 ft) wide and 5.4 m (18 ft) high. The area irrigated by the ancient irrigation network is about 69,000 acres (28,000 ha). I am posting this with extreme anguish……it is only cynical to write about wrongs…..but still… On TV – you see young persons in an emotion filled scene leave home – heading for the services…………..life and reality can be cruel. Kashmir alwyas enchants when seen in movies… we like the snow, the glaciers and imagine trekking in places like Leh in Ladakh. Then there is the most talked about ‘Siachen Glacier’ …….. before we read something on Kargil War and its heroes here is a small snippet…. Army life no doubt is most sternous…… the one at Kargil is tougher still….soldiers stay away from their families, their beloved ones, with little or no communication ….. but life at Kargil is tougher…. ~ there would be freezing temperatures, life in tents and most strikingly no human connect at all – the next person could be miles away and supplies could come at a long frequency……… the depression could often lead to mental disorders… yet soldiers struggle, survive and sacrifice their today for our tomorrow. The Kargil War, the armed conflict in 1999 will ever remain a scar… though India triumphed – at least 527 Indian soldiers lost their lives……. Here is something on a Hero, who was hardly 22 and had joined the Indian Army 4 months earlier. Months earlier, the family was at Amritsar station proudly seeing off their son as he boarded the train to join the 4 Jat regiment as a lieutenant. ~ and sadly, the family could not see him again. What a tragedy and how inhumane the killings had been. When Pakistan returned the bodies of Lt Saurabh Kalia and his five men – they were in extremely mutilated conditions. Conventions of war do not mean a damn for a nation like Pakistan. In a war where an individual life loses its meaning, dying with dignity is probably the only hope. Dignity is precisely what Pakistan has violated: of our soldiers, their families and of this nation. According to the Geneva Convention, Prisoners of war must at all times be humanely treated. Captain Kalia of the 4 Jat Regiment was the first Indian Army officer to observe and report large-scale intrusion by the Pakistani Army into the Indian side of the Line of Control in the Kargil sector of Jammu and Kashmir. He and five other soldiers were captured on May 15, 1999 and were in captivity for more than 20 days. Captain Kalia, and other soldiers had been tortured and tormented. This year a few months back on a day the Supreme Court asked the government to explain whether it will take the case of Kargil martyr Saurabh Kalia's torture to the International Court of Justice (ICJ) at The Hague, visiting Pakistani interior minister Rehman Malik said he was not aware whether Captain Kalia "died of a Pak bullet or weather". Captain Kalia's case was raised by India in talks with visiting Pakistan Interior Minister Rehman Malik. India asked Pakistan to take action against those responsible for torturing the officer to death. Now comes the sad news that the Govt of India has stated that torture inflicted upon on slain martyr Capt. 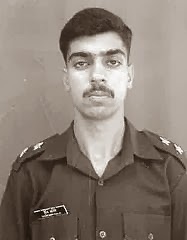 Saurabh Kalia by the Pakistan Army cannot be termed as a war crime. Counsel for the martyr’s family Arvind Sharma said the Union government told the Supreme Court that it had no intentions to raise the issue in the Geneva Convention since it was a signatory in the Shimla agreement of 1972. Pakistan may have denied for long that Captain Saurabh Kalia, and five of his platoon members, were tortured and killed by its soldiers during the Kargil War of 1999, but a video that surfaced on the web has nailed the lie. A video shot during a function of the Pakistani Army to felicitate Kargil heroes shows a Pak soldier reportedly admitting to killing Captain Kalia. Detailing his exploits with the audience, Pakistani soldier Naik Bhule Khandan boasted about his ‘heroism’ and admitted that he and his fellow soldiers had killed Captain Kalia and five of his platoon members. It was not mere killing on war field …. They were tortured for weeks before being killed. Their mutilated bodies were handed over to India on June 9, 1999. Autopsy reports had shown extreme torture including cigarette burns, ear drums pierced with hot iron rods and amputated limbs. 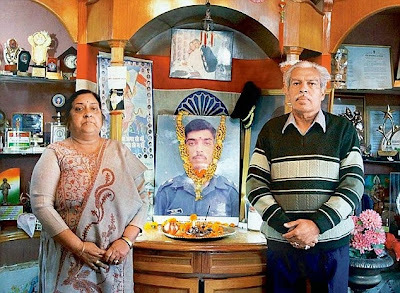 The present move is clearly a cold feet and means that Captain Saurabh Kalia will get no justice, not even from the government of the nation he so bravely died for. Daily Mail reports that in an affidavit filed by the Centre on a Supreme Court petition seeking to refer the case to the International Court of Justice (ICJ) says it can't be done. The Ministry of External Affairs (MEA) says in the affidavit that it cannot move the ICJ as Pakistan might not permit it, and no country can be so compelled to. It says the effect on relations with our neighbour country has to be kept in mind, and that "moving the ICJ is not a legally enforceable right". N.K. Kalia, the solider's father, naturally expressed his disappointment at the Centre's stance. "Why is Indian government going soft on Pakistan even after several wars, continuing infiltration and export of terror? It is not just an issue of my son but no other Indian soldier shall be treated like this. There should be a deterrent," N.K. Kalia says, adding he will submit CDs of the Pakistani soldier's TV confession to the Supreme Court. So yet another time a Political decision taking umbrage as a National perspective is cowing down the ethical responsibility of the Nation to respect, and protest a legally enforceable right. Feeling very sad indeed.